RuUp4It? : Welcome back everyone - R U Up 4 It once again? Welcome back everyone - R U Up 4 It once again? Don't know about you but the highlight of our summer has been the fantastic growing conditions - how did you manage to keep your school garden growing? Flowers look after themselves and the peas and courgettes have done really well outside too as it's been relatively warm. It's worth taking a risk sometimes. We'd be interested to hear how you kept your garden going over the holidays. Another highlight as always was THE BLACK ISLE SHOW. RoWAN shared a marquee with the Highland Countryside Initiative (or Royal Highland Education Trust) and provided an opportunity for visitors to try their hand at the giant compost jigsaw which is always popular. We also had a few examples of seasonal veg to test people's thoughts on how far the produce had travelled to the Show. It turned out ALL the veg had only come one mile - but the banana and lemon had travelled 1000s of miles between them. 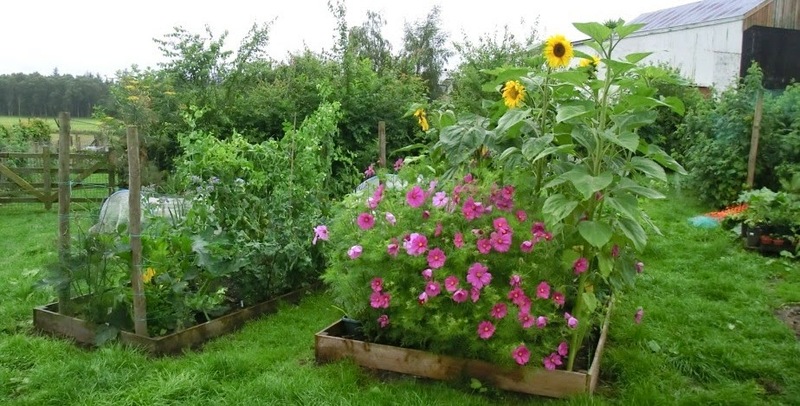 So yes, you can grow a wide range of tasty vegetables here. We also took the chance to promote the FREE workshops we are are putting on over the next few months - cooking to save money, creating a kitchen garden and composting for beginners. Keep an eye on local publicity for dates and venues. Muirtown and Tarradale Primary Schools will be sharing with us their plans for their polytunnels - maybe it'll inspire others to look at growing under cover. Get in touch if you'd like to know more.